The Michelin Road 5 aims to satisfy one of the most demanding segments in motorcycling—the sport touring category. This requires tires that provide exemplary performance in a wide spectrum of conditions. First introduced in 1996, the Michelin Pilot Road series—now simply known as the Road series—has been a competitive option for those requiring performance and mileage, along with all-weather capabilities. Quite the tall order, as a sport-touring motorcycle tire needs to be everything to everybody. 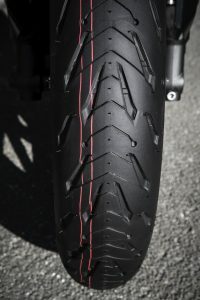 I tested this new set of rubber on middleweight and liter bikes alike, running the gamut of the sport segment. Test mounts included venerable Aprilia Tuono V4 1100 RR and Yamaha MT-10, to the stout KTM 1290 Super Duke GT and Ducati SuperSport, to the rip-roaring Triumph Street Triple RS, as well as the spritely Yamaha MT-07. I tested the Michelin Road 5 tires in a mix of riding conditions throughout the southern countryside of Spain and at Circuito Monteblanco east of Seville. The Road 5 aspires to deliver a greater level of performance in all conditions, with a strong emphasis in the wet. In fact, we’ve seen some of these technical approaches from Michelin before in the Power RS—a pure sport tire. While those two product lines have different goals, engineers saw it fit to borrow from the Power RS heavily to beef up the sport in sport-touring. At a glance, the Michelin Road 5 is a dual compound tire with several tricks up its sleeve. Returning to the fold is the patented 2CT and 2CT+ dual-compound technology. A harder crown rubber compound is encapsulated by a softer compound on the shoulders to provide great mileage while also allowing sport-worthy grip on the edge of the tire. 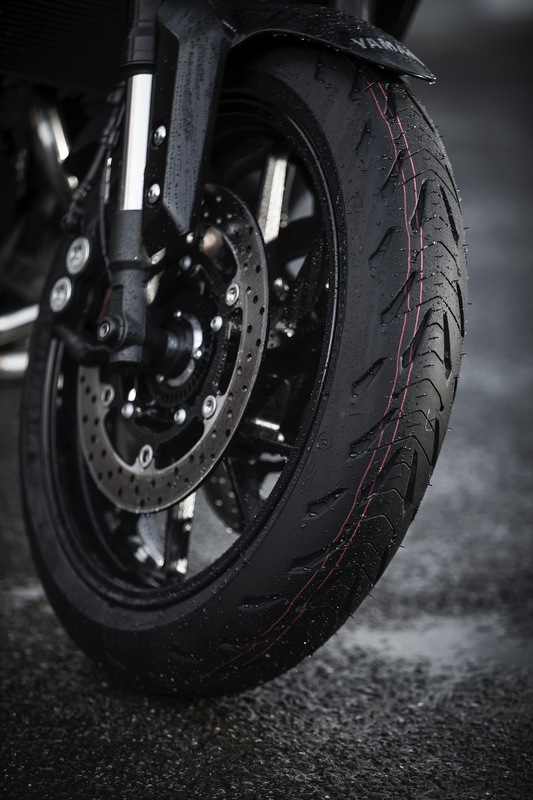 This allows a longer range of use before the profile of the motorcycle tire begins to square off (lose its shape and detract from the cornering ability of the tire), an issue commonly associated with single compound tires. In practice, this mix of compounds still delivers more than adequate feel and good grip on the road, even on uncompromising sport machines such as the Tuono, MT-10, and Street Triple RS. There’s more in that mix of batter at the Michelin plant. The front tire uses 100 percent silica rubber that, according to the brand’s engineers, has wet properties that are superior to the race-inspired, carbon-black compounds. To aid the speed demons in all of us, the rear tire makes use of a harder, silica based crown compound while the shoulders are made up of grippy carbon-black materials. In addition, the harder compound essentially cups the softer shoulder rubber, giving it a solid foundation and aiding in overall rigidity while on the edge of the tire. This section of the rear Michelin Road 5 has a lack of tread and siping for a specific reason—it’s designed to be used in dry conditions only and comes into play above 35 degrees of lean angle. Michelin feels that most riders will never exceed that amount of lean when in wet conditions. Aiding in the stable nature of the Road 5 is the ACT+, which has trickled down from the Power RS. This is a ply that wraps around the bead of the tire and reinforces the sidewall, as well as the shoulder to ensure greater stability while cornering at speed. Those attributes, coupled with the neutral profile of Michelin Road 5 tires, strike a balance between good turn in rates and overall stability. During my street ride in the Andalusian mountains, this aspect of the Road 5 was most pronounced while aboard the Tuono, a motorcycle that I’m intimately familiar with. In comparison with its stock tires, the Tuono’s handling was subdued slightly, making it a more approachable and less aggressive package. When rolling on the power during corner exit, the rear tire didn’t show signs of cracking under pressure and remained planted. In contrast, the MT-07 greatly benefited from the sportier Michelin Road 5 tires and provided far more confidence than the stock option. While the street riding offered great real-world context for Michelin’s new kicks, I also did three laps aboard the Ducati SuperSport and BMW S 1000 XR. In terms of handling, the smooth and gentle tip in remained constant. During hard braking points, I did experience some squirming, but this is far above and beyond this sport-touring tire’s purview. 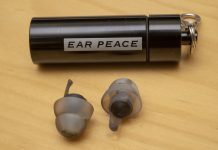 Should you be out for your first track outing and just want to seek some advanced training, you’ll be completely safe with these on your machine. Where the Michelin Road 5 tires truly shines over its predecessor is in the wet. 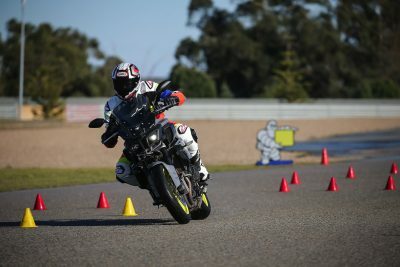 I rode six wet laps at Circuito Monteblanco aboard the Triumph Street Triple 765 RS and the Yamaha MT-10. With a soaked down circuit, the XST Evo siping helped displace water, allowing the contact patch to grip properly, resulting in greater feedback and confidence in wet conditions. For riders who need to tackle both wet and dry conditions, this is an invaluable characteristic. Corner entry with the Road 5 in the wet allows for an admirable amount of feedback, which any rider can benefit from—even when trail braking. Under hard braking from 70+ mph, the feedback is quite apparent, allowing riders to make emergency stops with confidence and maintain traction. I simulated that experience with a small chicane, forcing me to brake heavily while avoiding objects. The improved wet traction was noticeable. Commuters who deal with mixed conditions will greatly benefit from this improved wet grip. It is inevitable that a tire will lose grip and performance over time. As the rubber wears down, sipes lose their ability to displace water because they become too shallow. To tackle this issue and alleviate performance degradation, Michelin turned to 3D Additive Metal Manufacturing, which allowed engineers to create highly complex and dynamic molds that typical production methods are incapable of producing. This new process facilitates the XST Evo tread. Thanks to these unique molds, the sipes have trapezoid shaped chambers at their base. This allows them to displace the same amount of water as it would have at the point of purchase. When the tire wears down, the trapezoid sipe chamber can provide an equal amount of wet grip. In addition, this also allows the tire tread to have similar flex after prolonged wear has occurred. To illustrate this point, Michelin has claimed that a set of Road 5 with 3100 miles on them has the same wet braking performance as a brand-new set of Pilot Road 4 tires. Of course, mileage increases are always on the mind of sport-touring enthusiasts and Michelin is claiming that total mileage between the Pilot Road 4 and Road 5 are equivalent. In this case, the Road 5 has significantly improved wet performance, as well as dry abilities while also extending the useful life of the tire—something we can all appreciate. Riders looking to handle a variety of weather conditions, while still enjoying good levels of performance in dry, wet, or mixed conditions should have the Michelin Road 5 on their radars. Dry riding may be relative to its precursor but the wet handling capabilities, coupled with the Road 5 XST Evo technology, make the Michelin Road 5 an enticing offer for those who spend a lot of time on two wheels.